These are surprisingly similar to those famous "York Peppermint Patties", except they're entirely vegan. My kids and I love making them together because they're messy, sugar-y and covered with chocolate - what kid wouldn't like to make something like THAT!? And if you're looking for a perfect use for last year's red, foil heart-shaped candy-box, try filling it with these babies. Since it's close to Valentine's, I've been toying with making heart-shaped candy, but haven't actually done so. Yet. Stay tuned. These are SO easy, and really tend to impress the vegan-skeptics out there: another one of those "WHAT!?!?!? THIS is vegan?" type-recipes. Make sure your baked potato is mashed up very smooth, with no small lumps or anything. Add all ingredients together and mix well until a stiff candy filling (fondant) forms. Add additional powdered sugar until it becomes mold-able like playdough. The sugar amount can vary a bit. When the fondant is holding shape, take about a tablespoon of the mixture at a time and form into balls. Place them on the cookie sheet and press them down into a patty shape. When all are formed, place in the freezer for a few minutes until firm. Melt the chocolate with the margarine in a double boiler or a small pan balanced in a large pan of boiling water. Don't let ANY water get in the chocolate. Remove patties from the freezer. 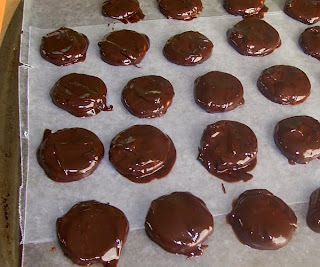 Dip the patties in the chocolate and place back on the wax paper. (For the dipping, I take a wooden skewer, poke the candy onto the end of it and then dip and remove with a flick of the finger. You have to figure out what method works for you. It is the only difficult part and MUCH easier to actually DO than to explain). When all are coated, place in the refridgerator until chocolate is set. Keep stored in the fridge. This is now the 3rd or 4th recipe for candy with potato that I've seen in the past month. . . I am dying to try this. And they look terrific, too! Candies made with potato, that is so creative. Great idea, thanks for the recipe. HAhaha, sorry Courtney, that made me laugh. Keeping the chocolate VERY hot and "runny" helps a great deal, and there's a trick to it - I've made these quite a few times and am just now getting to where I don't mind posting pictures!! Tofu Mom, what does the potato do in this recipe? Is it the stach, texture or flavor? I am surious. I have a Polish recipe for potato candy, and I have always wondered! Ok, I cannot spell tonight...sorry, I hope you can understand it...I am all giggly now! These sound great! I make chocolate covered peanut butter balls every year for Christmas and over the years my dipping skills have improved. You're right, it's just something you have to play with and find a method that works for you. I seriously want to try these. Oh those are yummy. I keep forgetting about these.